Wouldn't you love to meet and be able to whisper with this wonderful horse? "Minder" will be one of the animal teachers present at Brightlife this year to teach you to "talk" to animals! Have you EVER wondered what your animal was thinking as it looked up at you with shining eyes? Would you like to learn to understand animals so that you can help the animals and people you love? Join Amelia is the newly-renovated Brightlife facility and celebrate the this stunning retreat center which now includes a luxury spa. Have you ever wondered what you animal was thinking as it looked up at you with shining eyes? Amelia Kinkade knows! And she can teach YOU to understand your animal's thoughts, too. Here's the opportunity to discover what your animal wants, needs, feels, and REALLY thinks. Your discoveries will astound you! Amelia will take you on a magical journey into the heart of your innate power where you will rekindle your psychic senses and ignite your ability to communicate with other species. Amelia will help you hone these skills as you reach out with love to commune with animal friends. Amelia proves that telepathic ability is not a God-given gift, but a learned skill available to all of us with proper training, practice and dedication. Clairvoyance: (Clear-seeing) The ability to exchange mental pictures & even "film-clips" (moving sequences of events) to & from the mind of your animal friends. Clairsentience: (Clear-feeling) The ability to send and receive emotion to and from your animal friends. Clairaudience: (Clear-hearing) The ability to hear telepathic information in whatever language you speak. X-ray Vision: (Medical Gestalt) The ability to use your body as an instrument to determine if and where your animals are in pain. Starlight Vision: (Mediumship) The ability to send & receive messages from beloved animal friends on the "Other Side." Photo Talk: (Remote viewing) How to connect to distant animals using nothing but a photograph of the animal. Amelia will share techniques, tools, and exercises for developing your ability to communicate with animals and help heal animals; but more exciting still, she will help you explore how your animals and your love for animals actually heals YOU! With the correct dedication, Amelia’s mission is to show that everyone can do what she does with the proper dedication, training, and understanding. She sets out demonstrate the mechanics of how these processes work and how we all can learn to talk with animals. Her end goal is to reveal to those who haven’t discovered it yet the dazzlingly deep and powerful emotional world of animals. Exploring the subtle cues that form the foundation of animal communication, Kinkade shows, in carefully constructed guided exercises, how her students can explore these cues for themselves. With gentle encouragement, she will share the secrets that have inspired thousands of people she has taught throughout the world. This seminar will inspire students to sit down with the animals in their lives to explore the unspoken world between them. Brightlife attracts one of Amelia's most intimate groups and it garners her most international students. Animal lovers fly from all over the world, as far away as Brazil, the middle East, and Australia to study animal communication in this quiet private environment, a beautiful healing center tucked away in the hillside amongst green rolling hills covered in baby lamb. The Isle of Man, a magical mystical island in between England and Ireland. This green lush island has a fascinating history and the healing facility, Brightlife, has become a place so close to her heart, Amelia goes back year after year. The food is gourmet and the accommodations are 5 star. Please join Amelia here and learn what your animals REALLY think and want. Animal teachers will be present, including horses will also participate in order to teach you how to "whisper" with them. Please come celebrate the magic of animal communication. This workshop will be moving, powerful, and life-changing. In order to sign up for this magical experience of a lifetime, please visit: www.brightlife.com. Please register early to secure your place as this popular course fills up months in advance. 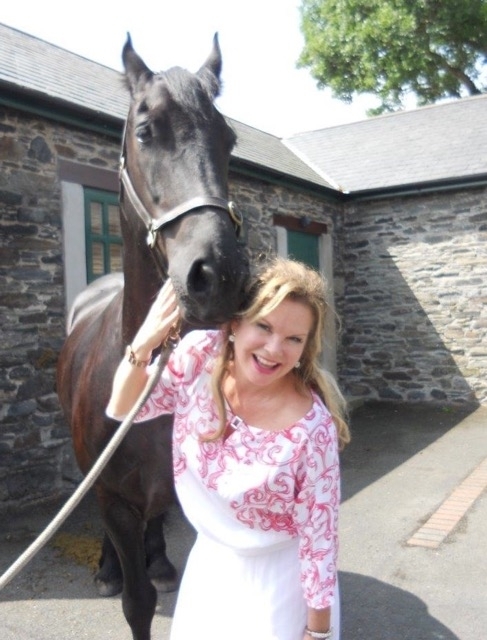 Amelia Kinkade is an international speaker and the author of Straight From the Horse's Mouth: How to Talk to Animals and Get Answers, and The Language of Miracles: A Celebrated Psychic Teaches You to Talk to Animals. (New World Library) She was featured in The 100 Top Psychics in America, and her work has been the focus of articles in publications such as Kindred Spirit, New Woman, The Wave, Fate and Fortune, Take Five, Women’s Own, The London Sunday News of the World, the New York Times, ABC Online, Good Housekeeping Magazine, and a multitude of newspapers in Britain and around the world. Her remarkable abilities have earned her appearances on shows such as London Tonight, The BBC News, Lorraine Kelly, The Psychic Show, The Big Breakfast, the James Van Praagh Show, the Australian Today Show, Carte Blanche in S. Africa, the Animal Planet Network, numerous news programs globally, and a tour of appearances on BBC children's programs. A BBC documentary was created around her work with the elephants in the Kruger National Park. She has also been heard on dozens of radio programs in England such as The Johnny Walker Show. But her greatest honour was being invited to Buckingham Palace to work with the household cavalry of Queen Elizabeth the Second. She was also privileged to "whisper" with the hunting horses of Prince Charles. Her passions include working with lions, cheetah, elephants, sharks and penguins in Africa, tigers, primates, and other exotics worldwide, and helping charities who train seeing-eye dogs for blind children. “still-point” so that you can locate and employ your intuition consistently and build on the meditation skills required in learning to silence your mind so completely that you can translate the thoughts and feelings of animals.